Hello, friends! 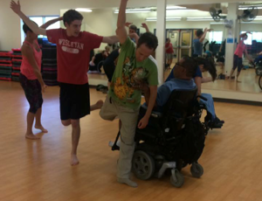 This is Olivia, project coordinator for Body Shift, VSA Texas’ acclaimed mixed-ability dance project. 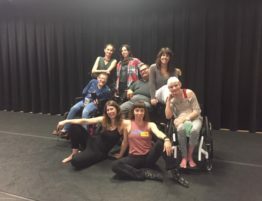 Every 2nd and 4th Saturday of the month Body Shift offers a class we call Elements in which we practice improvisational dance in an inclusive way. We use the DanceAbility method as our foundational approach but we also have guest artists teach class using various methods of movement improvisation and somatics including Tuning Scores, Contact Improvisation, and Body Mind Centering, to name a few. 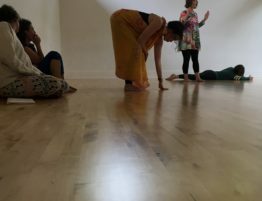 A through line that connects these varied methods is the idea that movement is generated by each individual dancer in the moment rather than by a choreographer or instructor dictating steps or phrases to be imitated. This means that movement inspiration comes from the inside out, from sensation, from feeling your body as it moves. Music can be used to set the mood but is not necessary in this kind of dancing. We work with the internal rhythm of our breath and body systems as well as our own desires for moving in ways that feel good to our bodies. 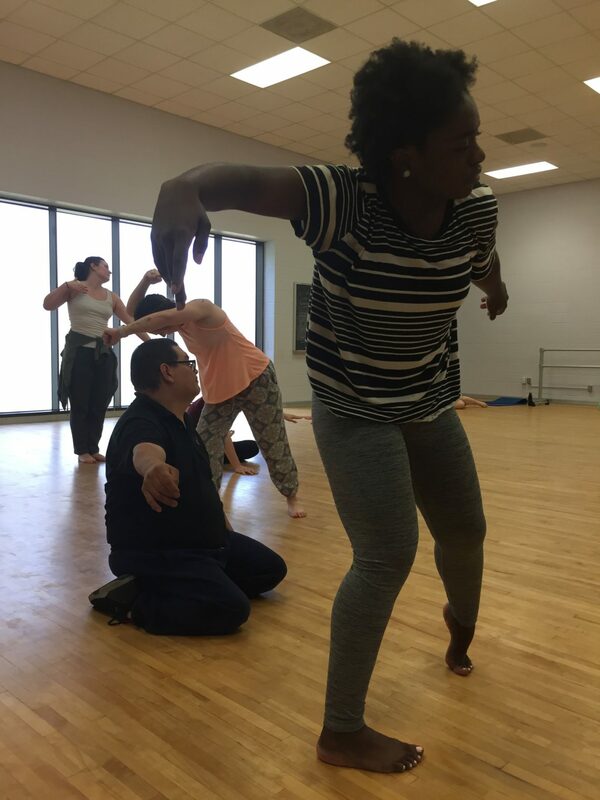 The instructor acts as more of a facilitator helping to shape the participants’ experience and providing narration of evocative imagery or anatomical processes that provide a sort of body map for checking in with yourself as you move. 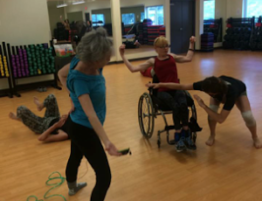 Offering exercises and scores that encourage interpretation rather than imitation makes it possible to have people of all abilities dancing together in an inclusive way. That said, if you are completely new to dance it might feel a bit daunting to be offered so much freedom right away. Perhaps what you have thought of as dance looks more like ballerinas or ballroom dancing and maybe neither of those styles fit your body’s shape or abilities. Something to recognize is that all forms of dance were designed by a person or group of people who agreed upon and formalized a specific way of using elements of movement that were available to their body(ies). Perhaps someone is athletically or acrobatically inclined. They might champion techniques that make use of those skills. One of the things I appreciate about improvisation is that you can be athletic or not. You don’t have to be able to do a pirouette or the splits to be a skilled improviser. Instead an understanding of the fundamental building blocks of movement are emphasized. 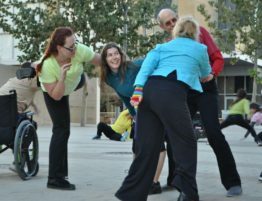 That is why each time our on-going Elements class meets we structure class around a theme meant to develop the students’ understanding of the way their bodies can move creatively, beyond habitual movement patterns. Sustained or lyrical – This is constant, even flow of energy, which produces movement identified by its smooth, unchanging dynamic. Whether the person is moving fast or slow, no noticeable change occurs in the speed, rhythm or effort needed to execute any movement. Percussive – In contrast to ‘sustained,’ this is energy that strongly pulses at regular or irregular intervals, to produce sudden and dynamic changes in the speed and rhythm in which the movement is executed and in the amount of effort needed. These are sharp, sudden changes in the dynamics of the movement. Suspended – Here the energy is constantly and evenly applied so as to combat just barely the forces of gravity acting upon the body. 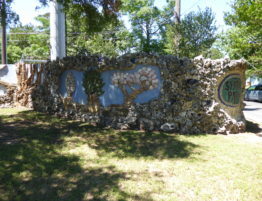 It produces the visual image of the body rising slowly. Collapsed – One cannot suspend indefinitely, eventually one must release or discontinue expending energy and when that happens the body ‘collapses.’ This may be done slowly or quickly but the end result is the same: The body falls back in on itself and down toward the ground as gravity takes over. Swinging – Energy is percussively applied at the beginning of the movement phrase, and the body collapses progressively in a sustained manner until it rebounds up into a suspended quality as gravity in a gradual sustained manner takes over once again. You might keep these qualities of energy in mind when going about your day. You will notice that you and those around you are employing them without conscious effort. Mental and physical states tend to produce the same energy quality in people’s movement regardless of background or ability, (i.e., anger tends to produce percussive movements; someone trying to make a decision may suspend their body and hold still so that the senses and mind can function efficiently; happiness leads people into a swinging, carefree state). I will guide participants through an exploration of energy transformations as part of our warm-up for the summer jam coming up in a few weeks. My hope is that allowing time to investigate these qualities more specifically before opening ourselves up to free dance will result in dynamic energy shifts during the jam as well as help us continue to study and break out of our habitual ways of moving. Body Shift: Summer Dance Jam. Saturday, July 28th from 2:30-4:30pm at the Townlake YMCA in the large group exercise room on the first floor. Adults (age 18 and up) of all abilities are encouraged to attend. Some experience with improvisation is best. No membership required. Cost is on a sliding scale of $5-$20.